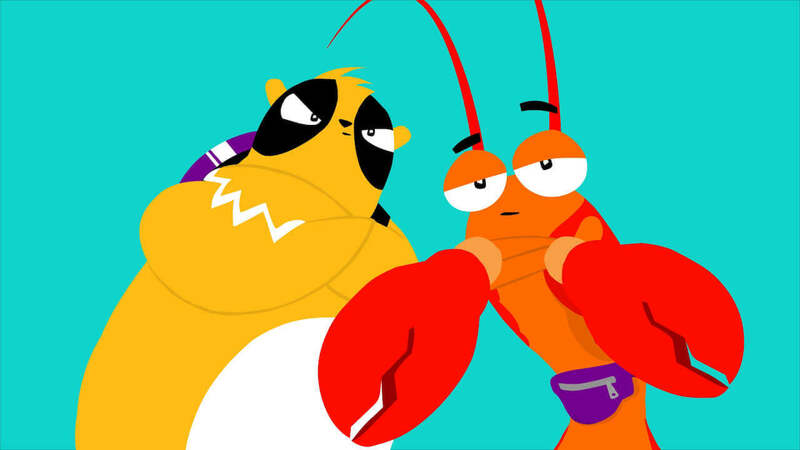 A hilarious and bizarre show following the adventures of time-travelling pals; Tinkershrimp, a welsh talking langoustine, and Dutch, an extremely fast slow loris. They are best friends and bodyguards of King Hunnybun, the eccentric monarch of New Great Great Britain. ‘Madness!’ I hear you say… Yes that’s exactly what we were thinking when we were asked to be the animation team to bring life to Nickelodeon’s first UK interactive digital series, created by the agency Ralph. Oh, and did we mention the ‘hater of all things nice’ – Michael The Fowl, a headless chicken that hatches evil plans whenever a dastardly deed is required. As a production company, Mummu were asked by exec producer, Chris Hassell, to develop Ralph’s existing character designs into five fun and lively 2D character animations for Nickelodeon to release online. This process began with collaborative creative meetings between Ralph and Mummu, outlining the important traits for all of the main characters. From the first read-through of the scripts and seeing the characters, Mummu founders, Sam and Karl, were very excited to be part of this completely original and hilarious new British series for Nickelodeon. The Mummu team couldn’t wait to start developing Ralph’s designs, adding extra personality and expression through movement. From initial loose pencil sketches, Mummu created fully artworked character sheets of key poses that best expressed each individual’s charisma and quirks. Following review of initial sketched animatics from Ralph, both studios met regularly to discuss whether the stories were clear and jokes on time. The characters were animated using Adobe Flash, with initial blocking out of key poses, followed by a second pass perfecting in-between frames and adding extra subtleties. The style of animation that was used focused on expressive facial animation of the eyes and mouth, and punchy pose-to-pose animation. As well as the importance of a catchy theme-tune that you’ll be humming all day, created by Franz Ferdinand’s Nick McCarthy and Andy Knowles, it was crucial for the characters to sound as hilarious as they looked. Ralph arranged for a stellar cast of actors to perform the voices of the main characters: John Boyega as Dutch, Darren Evans as Tinkershrimp, Alex Lowe as King Hunnybun, and Sam Riley as Michael the Fowl. It was then down to Mummu to make sure the characters look as good as they sounded… no pressure there then! During the production Mummu also had the pleasure of playing host to Nickelodeon, who enjoyed meeting the team and chatting with the animators. We also filmed behind the scenes extras to help educate children and inspire them into a career within the animation industry.